Nidoking wrote: Appearently they fixed it! I got 10 hydraulic tools out of 10 flights. Primary Needs: LVL 8 Upgrade Items Secondary: Fuel Hose, Wireless Compass, Jumbo Repair Items. I need only 1 item to complete the collection for the first time, i believe it's the last one, the doll. I'm going to try to get that collection 4 times and get the prize (crop circle)! Good luck! I'm trying to finish a first collection, too... too bad there's no bonus to increase drops from the UFO (like the spyglass for flights)! Still can't visit neighbours without crashing, so thought I'd try an intensive session to Area 51. Had amassed a serious fuel stockpile, polished a Spyglass then got the jets going non-stop back and forth. Uniquely for GI, the drop rate was incredible and even for each item - finished 7 UFO collections after 35 flights. Hydraulic tool dropping every time - used ~15 now and already got one crop circle. Been backing up every few minutes, but only crashed once after a rocket launch. For the record, jets get stars after 23 - 23 - 46 flights, and you get a new map to area 51 after first each of the first two stars. Run out of fuel now so a long way from the third; presumably it'll give a UFO collection. Good luck those still able to play! got stats of the crop circle ? Sorry not yet. TDV mentioned that drop rates plummet when collections are taken, so rather greedily am going for a second with 20 hydraulics still left. jon- wrote: Hydraulic tool dropping every time - used ~15 now and already got one crop circle. You completed FOUR "Truth is Out there" collections with only 15 hydraulic tools? Wow. That's pretty amazing. I've flown to Area 51 47 times... After using 28+ Hydraulic Tools I've only managed to get a total of 3 items to drop from the UFO. Oh well. Well, that's cool--whatever works As for me, whenever I use a hydraulic tool on the UFO, it simply disappears without a drop. I'm using the spyglass again, so maybe I'll get lucky. Very helpful, thanks! I need to remember to set aside 48 hours of the current remaining quest time to visit the movie theaters 10 times. You also need to launch Prometheus rockets to send alien home. I flew 90 times to Tunguska and I didn't finish the firts collection "Above & beyond"... It's imposible to take all items for me. Yes - definitely seems to be the Spyglass. I hadn't realised it worked on anything other than flights. However this morning (well after Spyglass had finished) used 6 hydraulic tools and got nothing; eventually getting one drop after recycling a few times. With the Spyglass I was getting 1-2 items most times. This is a side mission so does not have to be completed within the mision-timeframe - these will continue after the time limit for the main mission expires. For the main mission you only need to complete the tasks that are on the main mission list (the one with the timer on it). Ah, I should have known that would be the case, thanks for pointing it out! Wow, good to know. I'll give it a try! 1. Visiting neighbors movie theater, bookstore, and seafood restaurant count also for the task. 2. My game will not even open anymore. I was 1 collection away from finishing the outer space promo! dennisdc wrote: got stats of the crop circle ? It's 2 x 2, has to be built on city side but doesn't need road. Gives 216 coins every 72 hours and adds 20 passengers to your terminal limit (like Alien legacy). Doesn't say that it drops anything extra. After completing the challenge to visit a ufo in your airport, the next challenge is "The language barrier" which is just a series of ???????? and ,,,,,,,. Does anyone know if the stars counter for area 51 restarts every time the map expires? iten wrote: Does anyone know if the stars counter for area 51 restarts every time the map expires? My flight is never accurate...I am having trouble with my 1-10 section...i have made at least ten flights, but it says i still have 21 flights left before i hit 1star. 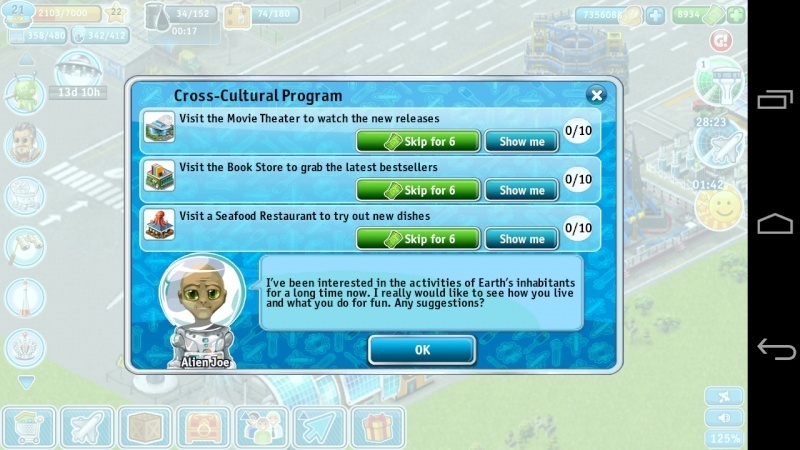 I finally finished the "It Came From Outer Space" promotion - that's funny is that, as soon as I collected the second "Truth is Out There" collection, all of the alien "side quests" finished/disappeared. Luckily, I was able to collect enough to get the Crop Circles - but I was disappointed to find out it only pays every 72 hours, and drops no items. Oh well.. I didn't have the Crop Circles but UFO Monument. This promotion is a totally disaster. True. Just hoping for a better payout schedule. I need advice with this quest.. it's a disaster. After 11 days flying only to Tunguska (more than 100 flights) and Rosewell (25 flights), I didn't collect any Ejection seat and I can't fly to Area 51 (I have 20 maps..). Some advince to get Ejection Seat????? Perhaps sending a few flights to Bermuda might help? Unless you haven't reached that level. I don't have the level to fly to Bermuda. I will try to the end. Finally I get the fighter jet! I'm going to fly to Area 51. I'm on 4-1-4-6-0. Just need a stealth module for 1 fighter jet. Finally finished and got the monument. I'll be trying to get items for another prometheus launch in case anyone needs help getting theirs done. Hope they fix it before it's over! Boarding/refueling speeds are eratic - sometimes really slow as if hangars aren't upgraded. I Need: Catering and Fuel Hose. Secondary Items: Blankets or Repair items. I Can Send: Fuel (3 Units), Passengers (5), Fuel Catalyst, Disposible Shampoo, ATM, Single Malt Whiskey, Cockpit Glass, Welder, Tour Review, Landing Lamp, Projector, Rope Block, Passengers (10), Powerful Radio Transmitter, Assembly Robot, Anti Theaft Gate, Eau de Toilette, Fuel Supply, Jet Engine, Whiteboard, Fuel Additives, Drill Machine, Solar Cell, Additional Radar, Make-Up, Smoke Detector, Spare Wire, Server Rack, Landing Gear, Oscillating Beacon, Flight Catering, Defroster, Navigation Module, Master Plan, Fuel Hose, Gyroscope, Spare Propeller, Deicer, Controller, Laptop, Router, VoIP Phone, Demodulator, Wirelass Compas, Centrifuge, Blanket, Altitude Indicator. yeah - same here. The hydraulic tool has been changed to "often" but with the last 8 jet flights i've had zero tools drop. In my case, the hydraulic tool is "always" and every completed flight to Area 51 drops one of them. Just checked and mine is now showing 'often' too now but I havent recieved one in 5 flights. Also, the 'desktop' icon isnt working, it is just showing an Android character on my Galaxy S2. Today it changes to "often"
I noticed the same thing. The planes that are housed in a hangar that is the planes level or higher are fuelling and loading quickly, whereas those that are housed in a lower level hangar are very slow. Another excuse to make you spend 80K!!! Must be all the good testing and cheking these lovely GIS developers are doing!!! They can't write a proper changelog to save their lives!!!! Just a question to clarify: If ALL of your hangars are the highest level, do the planes in them refuel at a good speed, regardless of their level, or do the planes have to "exactly" match the level of the hangar? rockmsockm wrote: Just a question to clarify: If ALL of your hangars are the highest level, do the planes in them refuel at a good speed, regardless of their level, or do the planes have to "exactly" match the level of the hangar? I can confirm that even a plane that is in a higher level hangar fuels and loads up with the expected speed, so its only slow if your plane is in a lower level hangar. So you shouldn't have any problems with your level 5 hangars. For me it is a problem as most of my hangars are level 1 with only 1 each of the higher level hangars, and since previously it wasn't a problem, only a couple of my planes are actually in the correct hangar.